One of my favorite Irving Penn pictures is an iconic portrait of a young Truman Capote in a corner with an oversized pea coat. Yes, the image is beautiful and Penn is, well, a bit of a genius. But there is something about Truman Capote in it that is so intriguing. He has the face of a very young boy and seems so fragile and tiny. I haven't seen the movie, but I really want to read In Cold Blood. I've heard lots about Capote and I know he was quite the character; a young Andy Warhol became obsessed with Capote and Warhol's first exhibition in New York was Fifteen Drawings Based on the Writings of Truman Capote at the Hugo Gallery (Thanks Wikipedia!). 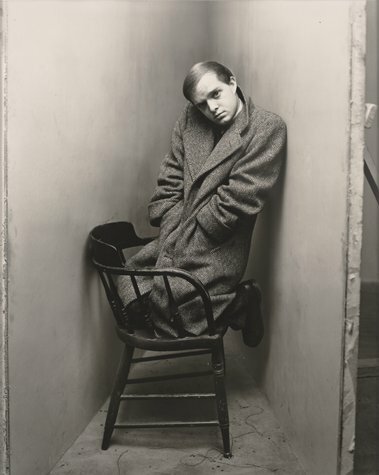 Eventually Turman Capote became quite the media personality, but his first "scandal" involved Harold Halma's picture (below) on the dustjacket of Other Voices, Other Rooms (1948). I fail to see anything scandalous about it, but I guess in 1948 that was a bit of a racy portrait for the dust jacket of a serious book. But it is the sensualness, the intrigue that that picture emanates that leads me to this post. In his early years, Capote was the subject of masters like Penn, Avedon and Cartier-Bresson. Every portrait that I've seen of him has been hypnotizing in a way, very coy and yet demanding. I love this contact sheet by Avedon as well of Truman Capote and killer Perry Smith. The two had a relationship -a result of Capote's research for In Cold Blood- that was very controversial and kind of legendary.